Queensland Diamond Cove residents are actively engaged in their community and keeping them informed is our top-priority. 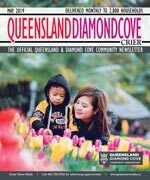 Queensland Diamond Cove Crier is the official community newsletter, and covers community news and is published monthly to keep content current and relevant. Delivered to every household, apartment, and business, every resident is acquainted with the community’s most important information. The Queensland Diamond Cove Community Association is a volunteer organization. It operates and maintains the Queensland Diamond Cove Hall on land leased from the City of Calgary, and supports local programs and events. Funding for the community association is provided by a yearly voluntary fee of $25.00, rental revenue, fund raising efforts and grants from government bodies. The Queensland Diamond Cove Community centre is well furnished and contains a gym, meeting rooms, kitchen and playschool. The community centre is used by such groups as the Brownies and karate. Queensland Diamond Cove also has several special events each year, including a Halloween party and a Winter Festival. There is also an annual parade of garage sales and barbeque. The community is also closely involved with the Friends of Fish Creek Park, who seek to preserve the park and its wildlife, and is involved with such events as the annual river clean up. In the City of Calgary’s 2014 Civic Census, Diamond Cove, with a land area of 0.5 km², had a population of 0,713 residents, living in 0,271 dwellings, a 2.0% change from its 2012 population of 0,699. The Median Resident of this community is 50 of age, and earns a median household income of $120,196 a year. The Median Price for Sold Homes was $570,000 in 2014. In the City of Calgary's 2012 municipal census, Diamond Cove had a population of 925 living in 271 dwellings, a -2.4% increase from its 2011 population of 716. With a land area of 0.5 km2 (0.19 sq mi), it had a population density of 1,400/km2 (3,600/sq mi) in 2012. For more detailed info visit the City of Calgary community profiles site.